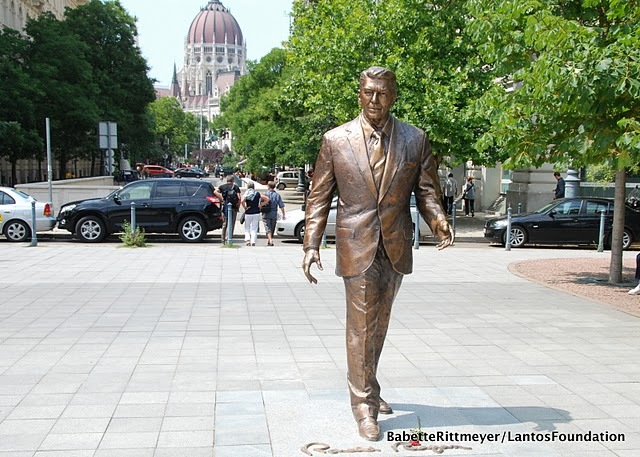 At first glance this statue of Ronald Reagan may seem a bit out of place in the center of Liberty Square in Budapest. It is there because the Hungarian people wanted to show their appreciation for the former U.S. president’s efforts in ending the Cold War, which in turn helped to end the Russian influence in Hungary. The statue faces the U.S. embassy, but at the same time it also looks directly to the monument commemorating the Red Army. BUDAPEST — Hundreds of Hungarians gathered at Liberty Square on Wednesday to witness the unveiling of a statue of Ronald Reagan and celebrate the man they credit with ending communist rule in their country. At a ceremony in the square, home to the U.S. Embassy, Prime Minister Viktor Orban praised the 40th president as a man who changed Central Europe. “Today, we are erecting here a statue to the man, to the leader, who changed, who renewed, this world and created in it a new world for us in Central Europe - a man who believed in freedom, who believed in the moral strength of freed people and that walls that stand in the way of freedom can be brought down,” Mr. Orban said. Mr. Reagan left office after two terms in January 1989, a few months before communist governments began collapsing in Europe . . . The Budapest celebration occurred during a week of similar Reagan commemorations in London and Prague, and in Krakow, Poland - all part of a year of Reagan Foundation events in honor of the centennial of the 40th president’s birth. I've also read that people often go up to the statue and shake his hand.